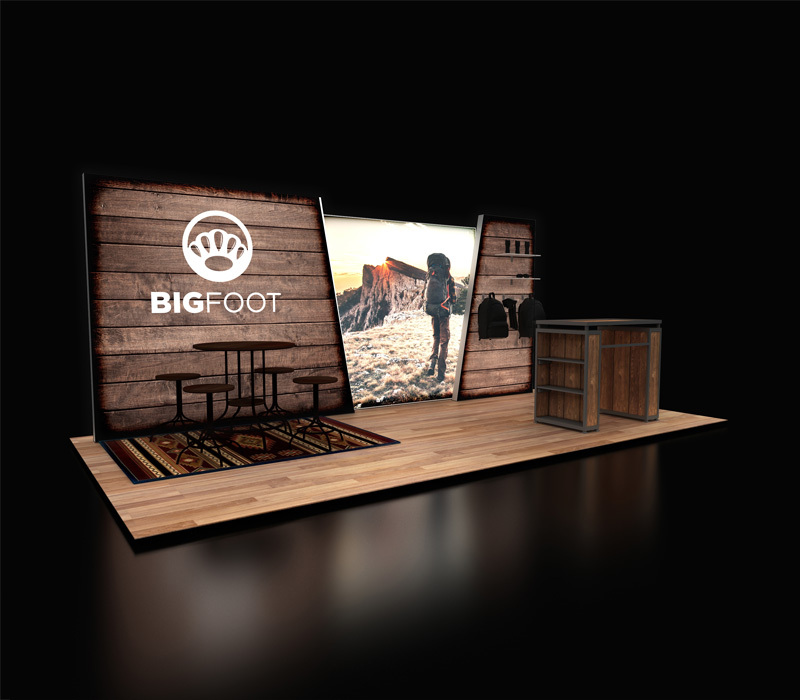 In the trade show industry using lightboxes in an exhibit design is very common. Not only are lightboxes popular in the trade show industry, they can be found in retail stores and in offices. You work hard to ensure your company has excellent graphics and a lightbox will give your brand the boost it needs to stand out in many different applications. Whether you're looking for a portable lightbox to take with you to trade shows or searching for a way to make the most out of a blank wall at your store or office, these 7 tips will help you make the right decision for your business! 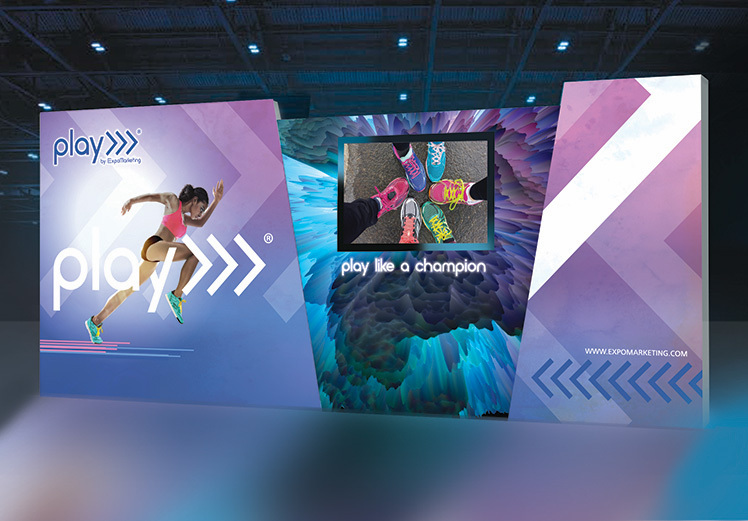 We often see lightboxes at trade shows that are mostly white, and while we do understand the assumption that white is a great choice in terms of brightness — it simply is not! 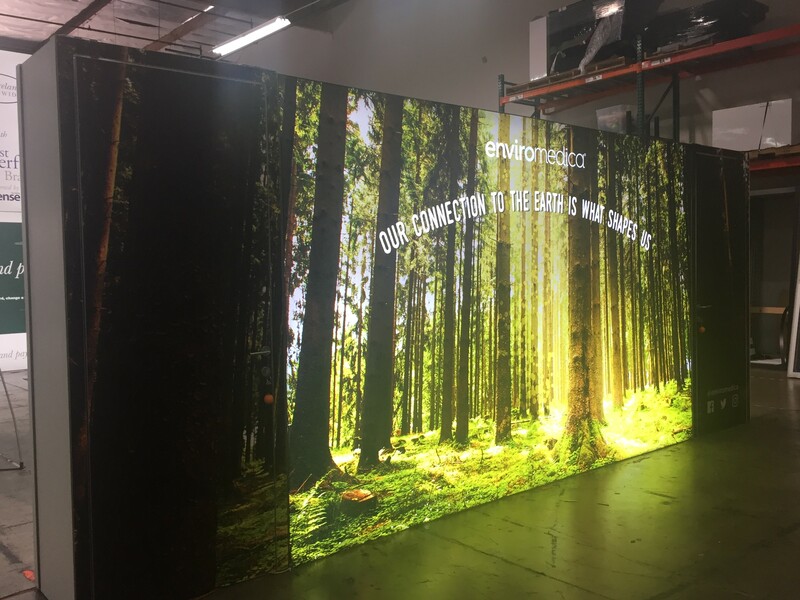 If you add backlighting to a mostly white design, your booth will miss out on the enticing appearance that darker and more vibrant colors create. If your brand’s visual identity requires a white design, we recommend going with either a fabric or sintra backwall. Always choose darker, vibrant colors to make your lightbox a true attraction, and as an added bonus, darker graphics don’t get dirty as easily as white graphics. Your lightbox won’t do much for the overall appearance of your booth if the entire box is covered in text. Images illuminated with a lightbox will make a stronger visual impact. If you do require a substantial amount of text within your trade show booth or in-store display, it is best to save it for sintra panels. Visitors won’t notice a big difference between reading backlit/non-backlit text, so always focus on images when designing for lightboxes. Make sure you test all of your lights. It is easy to forget to test the lights because they are contained in the lightbox. Also, pack a spare with you in case one goes out before the show. Testing the lightbox before the show can give you good practice if you are assembling it yourself at the show. Putting up the fabric allows you to double check for any typos, dirty spots, or any other possible errors. When you are price shopping or one vendor has one item but not the other you need, it is easy to pick lightboxes from different companies. Whether you like the backwall from one company and the counter from another, try to stick to only one vendor. Many times vendors have different printers and even if you are using the same Pantone color, one color can look different printed onto two different printers. If you stick to one vendor you will be a lot happier with the quality of colors. 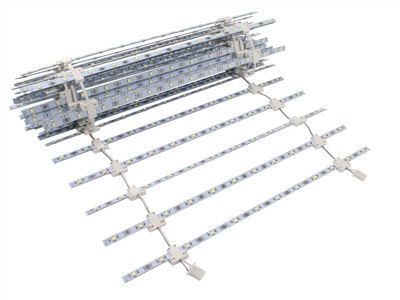 In the industry strip lights are often referred to as “edgelit”, and ladder lights are also known as “backlit”. It’s important to limit the use of ladder (backlit) lighting because you can end up with hot spots, which are areas of greater brightness. These hot spots are more likely to show when you have ladder lights in a backwall style lightbox. 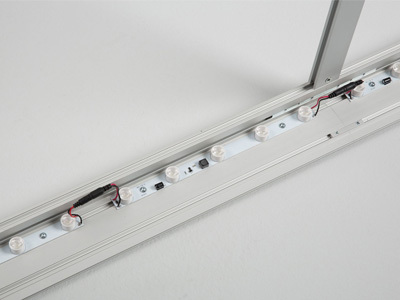 However, if you are using a lightbox with a thicker width such as a tower, ladder lights are still a viable option. When you have a lightbox as your backwall in your exhibit try to use strip lights instead of ladder lights to reduce the number of hotspots. Left image: Strip/Edgelit lights. Right image: Ladder/Backlit lights. The thinner the frame the greater your chances are of seeing shadows. Other ways that you can reduce shadowing is by using a thicker width for the frame. The width of the lightbox varies between vendors, but the standard width is around 5 to 8 inches. Mounting shelves and/or monitors to your lightbox can be attractive additions to your display, but if placed incorrectly, they can cast unwanted shadows. Always keep lighting and shadowing in mind during the design process! Most exhibit houses will only ask for high resolution images when collecting your art files. Sometimes it isn’t always possible to get high resolution images, especially if it is a specific photo that you want to use. However, using these images will make a huge difference when they are on such a large scale on the trade show floor. Choosing a different image if you can’t find a high res version of your top choice is better than compromising visual quality. Don’t give your potential customers a reason not to do business with you. Your trade show booth should be an extension of your company and brand, so don’t take any shortcuts! Ready to make a lightbox purchase or want to see our lightbox page for design inspiration? Explore more options here.